Ethiopian Orphans from Simon Scionka on Vimeo. This video is an incredible picture of the children that Hopechest supports through sponsorship. The care point I just wrote about, Kechene, is shown--two years ago when this footage was taken. For the past month I've gotten this song stuck in my head. I am busy with something and before I know it, I'm humming. Then, before I stop myself, it bursts right out, "No mohr! Mohnkeys! Shumping on da behd!" I blame the adorable children at Kechene. The beat of the song seems almost as if their teacher read the words and made up a tune. It's much more catchy than the version that I sang to my children. Now they sing this newer, jazzier version along with me. I apologize for the quality of the recording as my video camera froze up during the trip. These children, singing with their amazing teacher have been waiting for sponsors for two long years. The program here never got off the ground, and, thankfully, Greta Byers has stepped in. 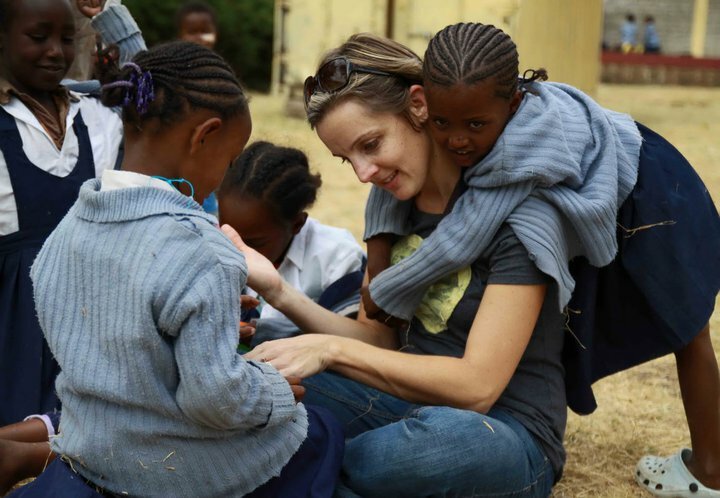 She's working to find sponsors for the 55 children at this school. Karen and Greta were busy getting individual photos of the children for sponsorship packages during this impromptu concert. Fifty children in ratty turquoise sweaters sang their hearts out as we watched from the edge of the room. We sat with our mouths agape reveling in their fantastic show. 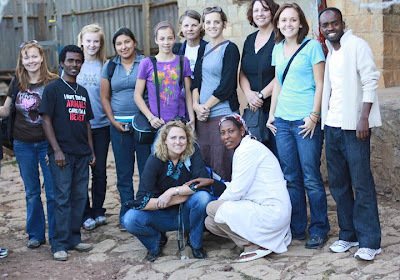 Our visit to Kechene came after a day visiting the Fistula Hospital. We weaved through small side streets until turning right onto what felt like an alley. The driveway ended at a tall blue fence, and sitting in front of the fence was a woman with woven baskets in different stages of completion lining both sides of the drive. She was coating them with dung as we got out. Right now, Greta has 20 children sponsored. Please consider sponsoring one of the children who have been waiting so long for someone to offer them hope! Have you ever been to a place that has a tangible enchanting quality? Maybe a church--busy doing God's work. Maybe even your home--a haven from the chaos of the world. At Trees of Glory the pace is slow and the children slightly reserved. I felt like we stepped into the middle of something very special. Maybe it was the exhausting drive from Addis. Once we arrived I couldn't have been more thrilled with getting out of the van with my limbs intact. Maybe it was Simret and Girma, who run the care point. I couldn't resist Simret, she is an Ethiopian version of my own mother. She enfolded us in hugs as we arrived, thanking us for coming. She grabbed my mom's arm as we trudged up the path from the river and assisted her in the climb. I think she enjoyed seeing an older woman on the trip (don't tell my mom I called her 'older'). They are working hard to make a difference in the lives of children who have little hope in their lives. The property itself is incredible with breathtaking views and several buildings. They were built by a Japanese construction company while they worked on the winding road we took from Addis. There is so much potential for an even more amazing work, but they truly need help. The government requires that they utilize the land or they will reclaim it. A stable is in mid-construction and awaits animals to fill it. A well that was used by the construction crew has long been abandoned and is filled with debris from vandals. There are many opportunities to be a help and blessing. Right now, a family who sponsors a child at Trees of Glory is doing a fundraiser to finish the stable and buy livestock. This would be one way to use the land that they have, ensuring that they don't lose it. One family who sponsors a little girl at Trees of Glory has taken the initiative and I'm sorry I didn't hear about them earlier to pass their fundraiser along. For just two more days you can purchase a "tree" to help Trees of Glory finish their stable and buy the cattle they need to finally utilize all of the land they have. Such a small thing from us will make a huge difference for Simret, Girma, the teachers, and so many children. Karen has children who need sponsors here also. The difference of sponsorship in the lives of these children is apparent in a post Karen wrote a few days ago. I did not recognize any of the children from their 'before' pictures. I scrolled down, saw the 'after' and had to go back, astounded. It's absolutely breathtaking. If that doesn't convince you that sponsorship works, then I give up. I had the wonderful opportunity to deliver a care package from my in laws to their sponsor child, Edelam. She was so shy that she wouldn't meet my eyes as I shared her new gifts. Edelam reaped the benefits of my mother-in-law's shopping skills--several clothing items, sunglasses, hair bows... The next day she was at the playground with her grandmother. She smiled brilliantly at me as she proudly showed off her newly braided hair adorned with bows, sunglasses in her pocket, and each set of clothes on her body. I am not a writer so I will admit defeat before even beginning to describe each of the care points. Pictures will do much more justice to the lovely chaos that greeted us at Kind Hearts. The property is in Addis, though once you pass through the gates it seems like you have stepped into another world. Gone are the fumes, beeping horns (horns don't honk, they kindly beep), and buildings in a perpetual state of construction. They have been replaced by fields of teff, acacia trees and rolling hills. It's an amazing transition. Upon opening the doors of the vans children are everywhere. It may seem that each child has several extra arms with which to grab your face smothering you in kisses while singing, "Selam!" It's beyond comprehension. Karen warned us, but I scoffed thinking, "Daily I have five children pulling, hugging, sitting on me. It really can't be that wild." It was so much more than I expected. These children were thrilled to have visitors. After the initial greeting, things slowed to a more manageable pace of just four or five children vying for a spot on or near a visiting adult. These children have been sponsored longer than any that we visited. This time last year Karen was arranging for sponsorship to begin through Hopechest. Since last year several projects have been funded and the care point has exciting plans to become self sustaining. The children are being fed daily, plans are in the works to get a nurse to visit on a regular basis. Sponsors purchased uniforms in the spring so the children could come proudly to school. Things are coming together, but there is still so much to be done! Before we left, Karen was notified that more than thirty new children would be at the care point when we arrived. Our team scrambled to make sure that these children would have a package to open. They did--and were so happy to have all of the little odds and ends we collected from our incredible group of friends back at home. These children were so happy to have a package of goodies, but they lacked the one thing that was cherished by the other kids--a photo of a smiling family back in America. Karen has details on her blog for sponsoring a child at Kind Hearts.